Greetings, fellow Commanders! Update 1.23 will bring a lot of exciting content to the game, today we’re here to share the newest feature info. Are you ready? Ranks are titles awarded of medals you’ve earned. 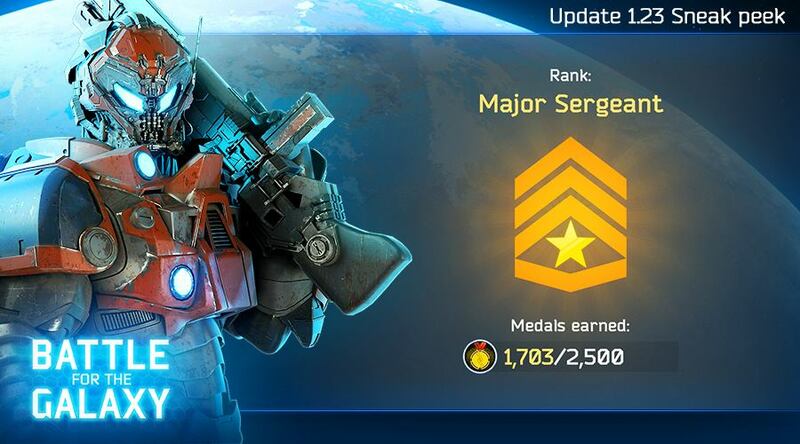 There are several Ranks that will show everyone your skill: starting with Trooper and ending with the Galaxy General. However, getting to the highest Rank and the top of the Leaderboard won’t be easy but indeed very rewarding. To get to the top you will need to earn medals, once you’ve acquired enough, your rank will advance, bringing you higher among the others and getting you better rewards. Season is a calendar month, when you can upgrade your Rank. Ranks will reset every month to add more spice to climbing the ladder: each month you will have a chance to improve your final standings or remain at the top. But this doesn’t mean that every month you need to start over from Trooper! The higher your ultimate results are – the better starting rank in the new season will be. At the beginning of each Season you will receive a reward, which directly depends on your Rank. The higher it was – the better the reward will be!